WWE Day of Reckoning 2 review Game Over Online - http://www.game-over.com If you're a wrestling fan, you know that the two things that make the sport special are solid storylines and athletic matches that ride the wave of energy from the crowd. Lame plotlines before a fight, and you might as well be fighting a dark match; don't respond to the crowd or perform, and you're probably not going to be a popular wrestler for long. For a long time, most wrestling games avoided these two basic tenets, amounting to little more than glorified beat-em-ups with recognizable characters. Fortunately, recent titles have been delivering more of the "behind the scenes" drama as well as the ringside action. Building upon this formula, THQ's released their most ambitious grappler to date, Day of Reckoning 2. Much more than imparting a sense of drama, the branching plotlines serve to introduce the numerous match types that you can fight your way through in the game in either story mode or exhibition matches. For instance, if a wrestler is getting attacked, you can choose to jump in and help, which automatically places you into a tag team match, or you can continue to prepare for your own bout. All in all, there are more than 10 different match types, including Fatal Four Ways, Tornado Tag matches, First Blood and Hell In A Cell. You'll also make your way through just about every pay-per-view event the WWE has to offer, including the king of them all: Wrestlemania. Along the way, you'll work with and fight against 45 Superstars. For the most part, wrestling matches play out the same as they did in the previous title; however, there are enough changes that have been made to the fighting system that players need to approach every single match with a different strategy. There are still strong and weak strikes and grapples, which can be reversed if you guess the incoming attack and time a button press just right. What's more, you'll still be able to change the momentum of a match if you're truly getting pummeled, giving you a chance to sway the battle, and the crowd, over to your side. The weight balancing system returns as well, making it relatively impossible (and realistic) for lightweight wrestlers to fling around much larger opponents. Unlike previous wrestling games though, you won't be able to constantly punch, kick and throw your opponent around. Continuously launching attacks drains a newly implemented stamina meter, which can leave you vulnerable and open to getting pinned quickly. This means that you'll need to pick and choose when you attack and when you rest up to recover your energy. Obviously, this defeats simple button mashing play, but it also keeps you on your toes, as you'll sometimes need to risk an attack in desperation when your stamina is dangerously low to gain a little breathing room. Sometimes, an attack will open up the possibility for a submission move, which you can use to regain some stamina and inflict additional damage. Once you’ve slapped on the hold, you flick the C stick in one of four directions that correspond to taunt, drain, rest or submit options. If you manage to select one that your opponent doesn’t choose as well, you slap the hold on and the punishment begins. On the other hand, if both selections are the same, the hold is broken and you become vulnerable to counterattacks. Obviously, you’ll want to successfully attach as many holds as you can so you can build up your spirit meter so you can pull off a special move. Unlike the original game, you have the opportunity to pull off your special as many times as you want within 15 seconds. This means that you can quire literally batter your opponent into unconsciousness, and if you store up your spirit during the match, you could theoretically pull off three of these time periods in a row. It’s little tweaks like these that make the gameplay much more engaging that previous years. While Yuke’s and THQ have been putting a great looking package together for their wrestling titles, Reckoning 2 is easily the best looking title to date. There are a couple of noticeable hiccups here or there; For instance, some of the ring entrances don’t have the same pop or even some of the same pyro as a live event, but this is a minor annoyance compared to the incredibly defined faces and builds of these wrestlers. Physically, they look more defined and realistic, with the glossy shine of sweat reflecting off a grappler’s body naturally. It might sound like a small step, but it breaks these characters away from looking like a plastic action figure and more like a real human being. Facially, however, is a quantum leap in design. These fighters look uncannily like their real-life counterparts, and there are moments where you are deceptively brought in by the facial animations, gestures and looks that they give during cutscenes and ring entrances. You will run into some discrepancies, such as created wrestlers not ever looking as good as the professional models. You’ll also have a few camera angles that can sometimes block your view of the action, primarily if you’ve thrown an opponent out of the ring to the floor. With a lack of ring or wall transparency, you can sometimes lose characters. 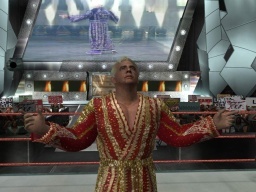 But by and large, this is a large visual leap forward for wrestling games. I only wish I could say the same for the audio. Unfortunately, you’ll notice that there’s no voiceover work in the game at all. 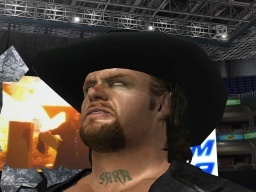 Nothing during cutscenes, no commentators repeating phrases, nothing. All you’ll wind up with is some crowd cheering, the entrance songs for wrestlers, an announcer for the start and end of matches and some licensed songs, which you’ll quickly mute. The game AI is greatly improved, and fixes a large number of bugs that the previous title never addressed. For instance, during tag team matches, you can direct your partner to attack the person in the ring, the ref or the opposing team member on the outside of the ring and they’ll carry these tasks out relatively well. There are still a number of hiccups that don’t make any sense, like wrestlers that will just stand over a knocked down wrestler and stare at them. 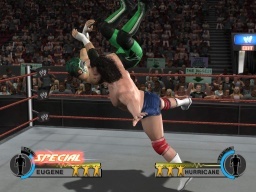 There also happens to be a really odd AI tweak during Fatal Four Way Matches and Tornado Tag matches, where every single AI character goes out of their way to hinder any strong attacks or special moves that anyone tries to pull off. This feels extremely unrealistic. Why wouldn’t the other fighters let you inflict pain on another wrestler so they could sweep in later and collect the pin? Next, it would’ve been better if the submission moves actually looked like you were doing what you chose. It would be awesome if you could tell the difference between verbally and physically taunting your opponent and those moments where you’re just resting before you try another attack on him. Apart from that, there are a number of other things that could’ve been handled a bit better. First of all, while I understand that the pro wrestlers look much better than the Create A Wrestler ones, I wish you had the option to import your previous character. Sure, navigating the Create A Wrestler mode again isn’t that bad, and is actually cleaner than the previous one, but it’s still inconvenient and somewhat jarring to spend all that time on the first story, simply to be handed a new wrestler and a new plotline carte blanche. Along with this, it would be much better if we could get larger rosters, many more legends and divas or a much more interactive story that involve all of the 45 wrestlers in the game at some point. While the plot behind the story mode is quite deep and involving, you’ll only deal with about half of the wrestlers during the story. What’s more, if Legends are going to be included, they should have more of an impact in the story, or possibly be within a special game mode that gets unlocked if you earn enough money and pay for the privilege in the WWE Shop. If you're a wrestling fan, you know that the two things that make the sport special are solid storylines and athletic matches that ride the wave of energy from the crowd. Lame plotlines before a fight, and you might as well be fighting a dark match; don't respond to the crowd or perform, and you're probably not going to be a popular wrestler for long. 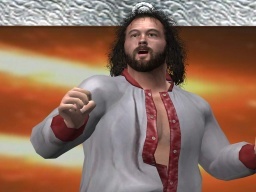 For a long time, most wrestling games avoided these two basic tenets, amounting to little more than glorified beat-em-ups with recognizable characters. Fortunately, recent titles have been delivering more of the "behind the scenes" drama as well as the ringside action. Building upon this formula, THQ's released their most ambitious grappler to date, Day of Reckoning 2. Easily the best WWE game made for the Gamecube and arguably for any system, Day of Reckoning 2 addresses a number of bugs from the previous title and adds a larger sense of strategy and timing to the game itself. Along with being the best looking wrestling game, it also packs a decent storyline. Wrestling fans will love this game.